Sometimes I wonder what God's plan is. Sometimes it seems like maybe his plan is not as good from my perspective as it is from His. Like maybe something that is a good thing in the grand scheme of His plan might just feel exactly like a disaster to me. Sometimes I think that maybe His plans are working out a bit more slowly than I want them to, you know? Ever feel that way? So I looked up the chapter in my Logos software to remind myself of the circumstances surrounding this prophecy. I've read through Jeremiah before, but it's been a while, so I wanted to get a refresher. What I found surprised me a lot! I had forgotten that Jeremiah was a prophet during the time that God's people were in exile from their homeland - they had been invaded, captured, and been deported to a foreign land. It was the ultimate disaster for them! Yet Jeremiah had a message of hope for them: God's plans for you are for good, not disaster. Of course, Jeremiah had an additional message for them: settle in, boys, because you're going to be here for a while. Jeremiah's message of hope was that God was going to redeem his people... later? God's plan was for them to be in a seventy-year time out, and then He would miraculously rescue them. And we find out in the book of Daniel that that's exactly what happened! God rescued them exactly when He promised! Do you think the people wanted to live in exile for seventy years? Of course they didn't. But God's wisdom, His plan, was that things would happen at a certain time, and that was the right time. There was something I was waiting on, and I wanted to know what "in due season" meant. He told me it was like the "due date" for a baby. You can know roughly what the right date is, and you can hope for a certain date, but in the end, the baby is going to be born at a time over which you have limited control. The baby is "due" at the right time. You may want him or her to be born three months after conception, so you can see his or her sweet little face, but that's not the right time. The right time is the "due" time. Sometimes your and my idea of the right time for God to answer our prayers doesn't match up with His idea of the right time. In general, you shouldn't try to modify the due time for a baby, and in general, it's probably not a good idea to try to influence God's "due season" for your answer to prayer. It might take longer than you want it to, but when the right time comes, God's going to make sure it happens! ...as it is my eager expectation and hope that I [Paul] will not be at all ashamed, but that with full courage now as always Christ will be honored in my body, whether by life or by death. If you enjoyed this message, you can check out the full series here. You know, year after year God has used Epiphany to effect our family in any number of ways. This year, as you will see, the Holy Spirit is clearly trying to tell my wife and me something! Read on for the details. First off: if you have absolutely no idea what I'm talking about, you might want to review some of my past Epiphany posts. The short version of the story is that for the past five years, every year in my family we have a special tradition on January 6th where my wife and I, as the leadership in our home, give one gift to each family member which we hope will lead each of us to a closer walk with the Lord in the coming year. In addition to that, every year I try to come up with something interesting to share with my family about the Wise Men, or the history of the church holiday, or whatever. Something relevant and edifying. Well, this year I realized that in my Logos Bible software installation I have access to lectionaries from several denominations, and those lectionaries contain Bible readings specifically chosen for use on any day of the year, especially holidays like Epiphany. I went through all of them to see what they have, and as it turns out, most of them had selected more or less the same Scriptures. And they were awesome. Old Testament: Isaiah 60:1-6 which is a remarkably vivid prophetic description of a bright light rising and appearing over Israel and people (including kings) bringing caravans of camels laden with gold and frankincense. Psalms: Psalm 72 in which David (who calls himself "the king" in his psalms) prophetically describes visitors from distant lands bringing gifts to one of his descendants (remember, Jesus was known as the "son of David"). Gospels: Matthew 2:1-12 which is of course the Gospel account of the coming of the Wise Men to see Jesus. Epistles: Ephesians 3:1-12 The significance of the arrival of the Wise Men is that they were the first who recognized that Jesus was given not just to the Jews, but to the Gentiles also (they were not Jewish). In this passage Paul explains that God has called him to share the message of Christ's salvation with the Gentiles as well. I actually copied all of these passages into a Word document to print out and read to the family - if you'd like to see it or use it, I've shared it here. As in the links above, I used the New Living Translation, specifically because my daughter is still young and I didn't want to confuse or bore her with long Bible passages she couldn't understand. So after we read through those passages and talked briefly about their significance, we moved on to the presents! At my daughter's school, they make a point to have all the kids bring water bottles, on the theory that well-hydrated kids make better learners. This year my wife and I spotted a cute sports bottle covered with flowers that has printed on it "I can do all things through Christ which strengthens me. Philippians 4:13". I explained to my daughter that sometimes there are hard things that people ask you to do - like a tough assignment in math class. God can strengthen you to complete that task. Then sometimes there are things that the Holy Spirit speaks into your heart - like showing love to someone who hasn't been nice to you. God can strengthen you to do those hard things too. She took it to school with her the next day - she really loved the multicolored pinwheel of a flower right in the middle! My son was up next. This past year he expressed some interest in Sherlock Holmes, so when I saw a book called A Sherlock Holmes Devotional I was immediately interested! Basically, the book contains a synopsis of a Sherlock Holmes story, and then a kind of "personal application" kind of thing that goes along with it. When I handed it to him I explained that we chose it for two reasons: first, we thought he would enjoy using it. But second, we wanted him to remember that sometimes you have to search out the things of God, look for clues to find them. When he opened it he immediately started leafing through it with a smile on his face - I hope it makes a big difference for him! 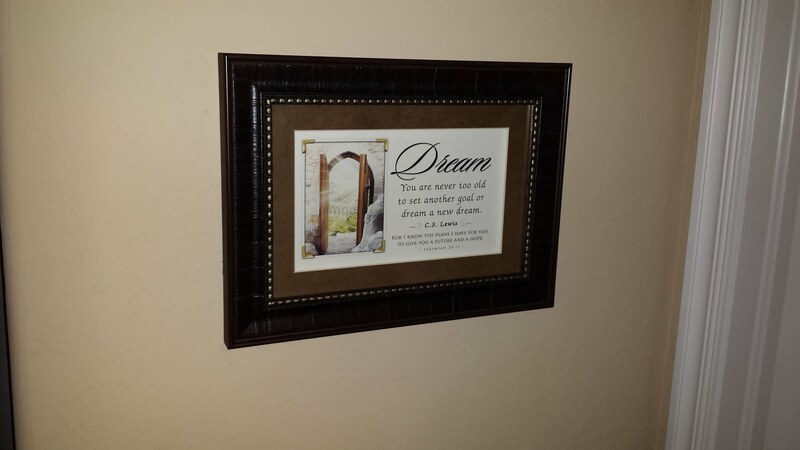 The "Dream" framed art, proudly displayed in our new house! Last of all it was my turn. This year my wife collaborated with my son, and they found a triangular office desk decoration that they liked for me. And it also has Jeremiah 29:11 quoted on it! Seems like maybe the Lord is saying to my family that He's got a plan for us this year, and it's going to be a good thing! It's really cool to see that God has laid similar things on my heart and on my wife's heart for the upcoming year. 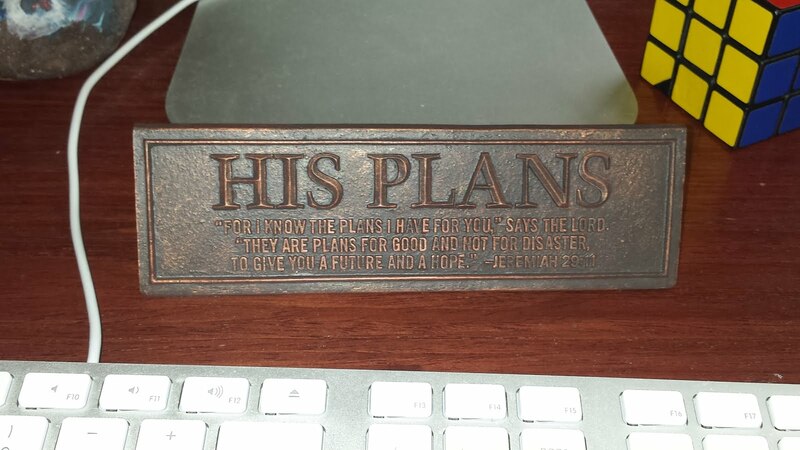 If you read my blog post last year, my gift to my wife displayed a verse that says that God would back up her plans (conceived of course from a Godly heart), and this year her gift reassures her that God has His own plans for her. 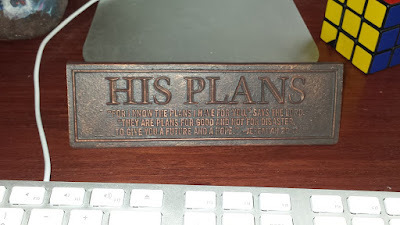 The gift I received last year said that I would be blessed if I put my trust in the Lord, and this year's gift lets me know that God's plans are for good things and not for disaster. How great is that? 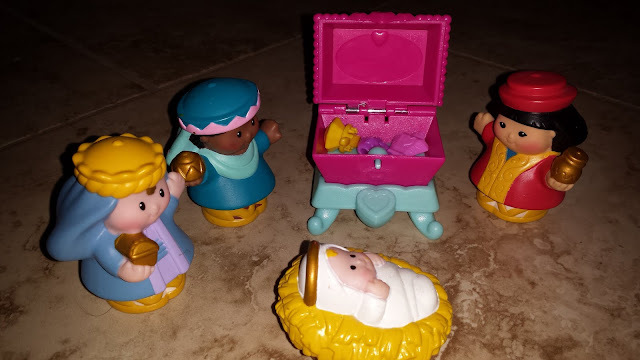 Epiphany was on Wednesday this year, and my daughter wanted to bring the Wise Men with her to church. I let her bring the ones from our Little People Nativity set, along with the baby Jesus, but she also brought something else: a chest from her My Little Pony toy castle, containing gold, frankincense, and myrrh. You can see it in the picture at the top of this post! I write about our Epiphany every year, not to make us seem so cool and spiritual, but because it is a special time for us. I hope you make your own "plans" next year to follow our example with your own family. It's one of my favorite traditions from the holiday season! By the way... if you are interested in purchasing a base package of the Logos software I mentioned above - which is REALLY incredible, by the way - get in touch with me so I can give you my email address. If you call them and tell them I referred you, with my email address so they can locate my account, not only will you get 15% off your purchase and some other valuable books for free, but I'll get a credit on my Logos account so I can add some stuff to my library too. Win-win! It's the most wonderful time of the year again! No, I don't mean Christmas, although that's the other most wonderful time of the year. I'm talking about a church holiday called Epiphany, which falls on this Wednesday. Epiphany (or "Three Kings Day", or "Dreikönigsfest" if you want to go all crazy about it) is the traditional holiday when Christians celebrate the arrival of the Wise Men in Bethlehem. It is a celebration of the revelation of Jesus to the Gentiles, which is what the "epiphany" (lower-case) is - when we understood that Jesus was a gift for all of us, not just the Jews. For some more about the Wise Men and their significance, check out the first part of my post about Epiphany from last year. Several years ago I started a tradition in our home that I hope others will adopt. You can read about the basic idea in the post I wrote the first year we did it, but essentially we (the parents, the leadership of our home) choose one single gift for each member of our family that is chosen specifically to inspire them to draw closer to Jesus in the coming year. We give a gift because the Wise Men brought gifts! The holiday is close enough to Christmas that it still feels like a gift-giving time, but far enough removed that it's easier to remember that this is all about Jesus, not reindeer or fat men in red suits or elves on shelves any of that other fun stuff. I encourage you to think about what you can give someone on Wednesday that might help them think about Jesus during the next twelve months. We always keep our gifts ver modest - $20 is more or less the limit on cost per gift for us. If you need some ideas, feel free to read back through my posts form past years about what we gave on Epiphanies past. Or just choose one person and give them something small, even handmade - as long as they know that this is about seeking more of Jesus this year. The Wise Men traveled hundreds of dangerous miles through desert wilderness to find Jesus and bring gifts. Maybe our gifts can inspire us to take a journey deeper into our relationship with Him!